There's still a party goin' on in British Columbia. This time, it's for the 2010 Vancouver Paralympic Games, which run March 12-21, 2010. 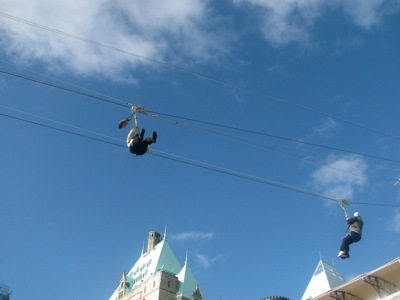 I was in Vancouver March 15-16, and there were people waiting in line for the popular zipline across Robson Square. But no more 7-8 hour waits, now it's only three hours (no, I didn't queue up, but I've done the Ziptrek at Whistler, scary but fun).